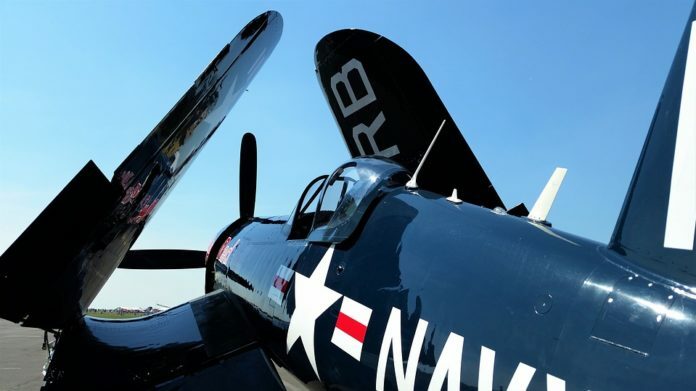 Jim Tobul’s Bamberg, South Carolina-based Vought F4U-4 Corsair, BuNo 97143 successfully flew again for the first time on August 7 following its nose-over accident in mid-May reports Richard Mallory Allnutt. Nicknamed ‘Korean War Hero’, the naval fighter overturned on landing at DeKalb- Peachtree airport near Atlanta, Georgia following a rapid and severe change in cross-wind conditions. Thankfully, Tobul walked away from the incident, but the aircraft sustained significant damage to the vertical tail section, canopy and turtle deck. The propeller and engine didn’t fare so well either, but other than moderate damage to the wing tips, the rest of the aircraft was left remarkably intact. Westpac Restorations in Colorado Springs, Colorado finished the Corsair’s initial restoration three years ago, and their team of world-class technicians got to work on the latest repairs. Tobul managed to source a replacement vertical stabilizer and rudder, along with a freshly overhauled propeller and engine. He already had a set of more authentic wings nearing completion at Westpac, so they didn’t prove difficult to replace. The damaged outer wing panels have gone back into the restoration queue, and will join another Corsair currently under Westpac’s care in due course. “Korean War Hero’s” new wings are restored to F4U-4 standards, and have all the gun bay equipment and rocket rail hard points. They are fabric- covered too, unlike the metalized wings Tobul’s Corsair had been using up until its accident. Amazingly, Tobul took the Corsair to the Pikes Peak Regional Air Show in Colorado on August 9, just a few days after the first post-restoration flight, a true testament to the strength of the man, Westpac’s crew, and to the Corsair’s rugged construction.